To protect fans from the elements, stadiums often install elaborate, custom-designed awning systems. 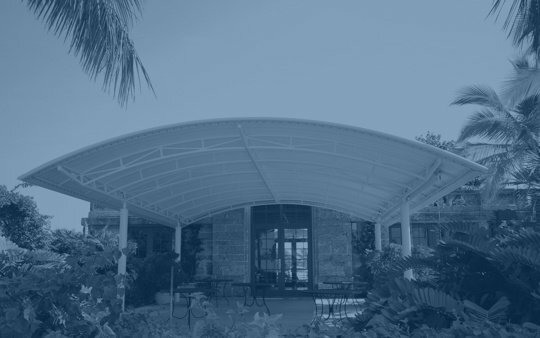 For architects, awnings offer a little room for fun and creativity, somewhere you can introduce color, branding, and other design details. A major stadium project can span thousands of square feet and require thousands of pounds in awning material. The success of that awning, both in the short and long term, hinges on the quality of the textile chosen. Product that isn’t durable can’t be easily replaced the way a restaurant or retail store awning can. Poor quality materials can result in constant, costly upkeep for facilities staff. For an awning to work, you need to choose the right material for the job. Vinyl fabric is the most popular choice for stadium awnings. It’s easy to see why — it’s the best choice for durability, safety, and maintenance. Above all, vinyl is designed to hold up under a wide range of environmental conditions. Traditional canvas awnings need replacement pretty quickly; organic fabrics like cotton tend to fade, stretch, and tear when exposed to the elements. Even treated and sealed canvas doesn’t do well in places where humidity is high. They also aren’t very opaque, which can result in a warming effect underneath the awning that can make seating sections uncomfortably hot. Wood and metal overhead coverings may seem more durable, but they come with a high replacement cost when they do need to be updated. Vinyl fabric is designed to stand up against the elements. Products like Herculite’s Weather-Chek are formulated to be UV resistant and designed to resist photo-degradation — a term that describes the fading and brittleness that comes with sun exposure. High grade vinyl will also be treated for mildew and mold for wetter days. Fire safety is of the utmost importance wherever large groups of people congregate. Along with structural integrity, fire safety is one of the big things building inspectors are looking for. As we note in our ebook on determining awning quality, the International Building Code has an entire section devoted to awning fabrics. Codes vary from state to state, and what is considered fire resistant will change depending on where you are in the world. But the tests are rigorous and not all materials get good grades. Natural fibers like cotton canvas can be highly flammable, while wood, which is often used to build coverings, is also susceptible to fire danger. On the other hand, vinyl fabric is lightweight, waterproof, and fire resistant. Awnings made with vinyl fabric are designed to be sturdy in the face of wind, water, and sun. High quality vinyl fabric is also designed with fabric strength for snow and ice. What about metal roofing, though? Metal is fire resistant, but it comes with its own set of safety risks. Metal coverings are more susceptible to corrosion and rust when exposed to moisture over time, which can make it structurally unstable. In order to prevent collapse, metal roofing will require more costly and sturdy framing to hold up — especially in climates where snow piles up. And that still doesn’t 100 percent prevent a dangerous situation from occurring. Keeping the stands cleaned and the grass trimmed presents enough of a challenge for many facilities teams. Taking care of awnings needs to be easy and painless, otherwise it’ll fall by the wayside. Thankfully, vinyl awnings are much easier to clean and maintain than those made from other materials. Making your vinyl fabric last requires occasional work — inspection, washing, storage during the offseason. This quick maintenance pales in comparison to the labor needed to maintain wood and other natural materials. For example, wood coverings need to be inspected for termites and other infestations, painted or stained annually, scraped down and refinished, and treated for rot when it inevitably occurs. That’s only just the start. By comparison, vinyl is the easiest to maintain, and tends to last longer than other materials when it’s well cared for. 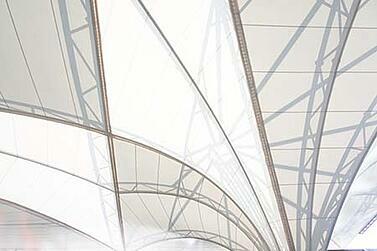 Choosing the right material for your overhead coverings can make or break your stadium project. A vinyl product like Weather-Chek that’s designed exclusively for high-end awnings can reduce your maintenance, offer better sun protection, and look great for longer than any other solution. Learn how Herculite vinyl fabrics are more effective than other materials at reducing energy costs for external awnings.